Gov. Dannel P. Malloy talks last week about coming budget negotiations. At left is Lt. Gov. Nancy Wyman. For more than 100 years, Connecticut has periodically grappled with what to do when the fiscal year begins and a new budget is not in place to greet it. Big question marks already hang over some social services for children, the poor and disabled, as well as certain aid to cities and towns. And Gov. 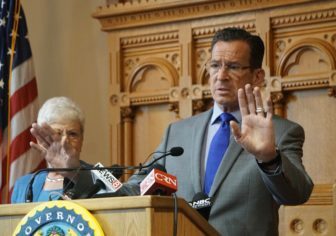 Dannel P. Malloy, who has warned legislators for several weeks now not to force him to run the state without a new budget in place, already has said he considers that option a “worst-case scenario,” and that legislators should as well. Ever since state Comptroller Nicholas Staub was reluctant to release education grants to local school districts in the absence of a state budget in 1892, state officials have tried from time to time to determine how to handle those rare instances. That just leaves one brief-yet-vital question: What is “essential” in the context of state government? Does it stop with feeding and guarding prison inmates and assigning troopers to patrol the state? What about the billions of state dollars that cities and towns rely on annually to provide local services and to ease the burden on property taxpayers? Are the programs Connecticut offers to assist the poor, disabled, abused children and the elderly “essential” enough to continue absent a budget that spells out how much can be spent on them? And as legislatures and governors grapple with these challenges from time to time, the attorney general’s office historically has suggested a different strategy: focus instead on getting a budget in place — even a temporary one. Legislative leaders after a testy budget negotiating session Tuesday. 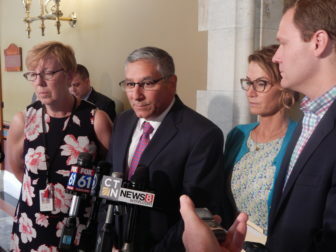 From left to right: Sen. Cathy Osten, Senate Republican President Pro Tem Len Fasano, House Minority Leader Themis Klarides, House Majority Leader Matt Ritter. The stakes are particularly high this summer. Regardless of whether Connecticut’s budget approval process is standing still, it’s expenses are not. Fiscal analysts say finances, unless adjusted, would run $2.3 billion in deficit in the fiscal year that begins July 1. But while that potential gap already exceeds 12 percent — and nearly matches the value of the 2011 and 2015 state tax hikes combined — the numbers are even more daunting just below the surface. Contractually mandated costs — debt payments, contributions into pension funds and other retirement programs, and Medicaid expenses set by federal entitlement rules — will grow with or without a new budget by nearly $950 million next fiscal year. And slumping General Fund revenues — most taxes and fees, lottery and casino proceeds, and federal grants — are expected to provide $802 million less next fiscal year than the revenue total assumed in the outgoing budget. Together that’s $1.75 billion worth of problems Connecticut must face after July 1. How does the governor deal with that? In some cases, Malloy’s options are very limited. While some expenses are mandated by contractual obligation, still others are fixed by court order, such as most operations of the Department of Children and Families. And still other programs, such as the Education Cost Sharing grant to cities and towns, are mandated by state statutes that make no reference to whether a budget is in place to support them. In other words, the state can spend only what the legislature has budgeted for that program, regardless of whether the law says it shall be offered. And if there is no new budget, then there is nothing available to spend. Some social service programs outside of the umbrella of Medicaid operate under that type of restriction. The state spends more than $1 billion annually contracting with community-based private, nonprofit agencies to provide the bulk of its social services. And Connecticut builds legal flexibility into its contracts with some of these nonprofits, enabling the state to terminate those agreements easily and with little notice. Connecticut entered the new fiscal year without a budget in 2003 and in 2009, and in both cases resources for some private, nonprofits were delayed. The state’s largest nonprofit coalition, the CT Community Nonprofit Alliance, warned this week that a similar situation certainly would harm some of the state’s most vulnerable citizens. 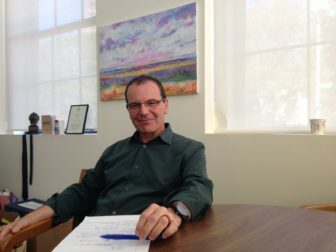 Gian-Carl Casa, president and CEO of the alliance, said his office has heard from a wide range of nonprofits providing behavioral health programs, various children’s services and programs for the intellectually and developmentally disabled. Some municipal grants also are not authorized once the new budget expires. Even more confusing, other grants would have been larger than what towns received this fiscal year, except that legislators placed a temporary cap on them. But what happens after July 1 when the cap expires but the grant program continues? And municipal leaders say many communities already were baffled this year when they built their budgets in April and May, unsure of what level of state assistance they safely could assume. Separate budget proposals from Malloy, Democratic legislators and Republicans all include significant cuts in previously approved local aid. The governor also has recommended billing municipalities for a portion of skyrocketing contributions to the teachers’ pension fund, specifically $400 million per year. 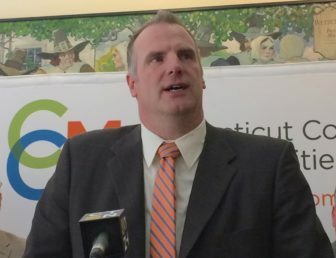 Joe DeLong, executive director of the Connecticut Conference of Municipalities, said at least municipal leaders are pressing their representatives and senators for guidance. “At least they’re all communicating a lot with each other,” he said. “But there’s not a ton of answers out there.” DeLong added, though, that the only real solution is for Malloy and lawmakers to resolve the budget soon. Towns already have begun to look into what services and programs can be deferred, he said, but a budget-less summer threatens not just local budgets, but Connecticut’s economy. The governor has said his staff began researching options weeks ago in preparation for potential budget gridlock. But the administration has declined to offer specifics about which measures might have to be taken after July 1 if no budget is in place. If lawmakers can’t settle on a complete new budget by July 1, a short-term plan is better than none, the attorney general’s office said 26 years ago. “The most prudent approach — and the one I strongly advise be taken in order to avoid confusion and uncertainty — is to adopt a continuing resolution,” Blumenthal wrote in his June 1991 opinion. He would repeat that advice in subsequent opinions later that year and in 2003. Legislators and Weicker would take that advice, enacting several temporary appropriation measures. But Republican Gov. John G. Rowland would reject it in 2003 when the Democrat-controlled legislature adopted a two-week spending plan, urging lawmakers instead to focus on passing a complete plan. Rowland would run the state’s finances through a series of executive orders until lawmakers sent him a new budget on July 31. Another Republican, Gov. Jodi Rell, also would employ executive orders in 2009 when she and a Democratic legislature battled over a new budget as Connecticut was slipping deeply into The Great Recession. The Rell administration eventually agreed to a $1 billion tax increase that included a major income tax hike on wealthy households. But she refused to sign the deal, taking advantage of a provision in state law that allowed it to take effect without her signature after a week-long waiting period. That budget became law on Sept. 8. Not all the news is grim if Connecticut again passes July 1 without a new budget. Unlike the initial years immediately after the last recession, state government’s cash flow is in good shape. Decades of fiscal gimmicks coupled with the last recession had drained the state’s cash pool, forcing Treasurer Denise L. Nappier at one point in late 2012 to set up a $300 million emergency line of credit. The state never had to draw on that credit, but Nappier frequently had to dip into capital programs, temporarily transferring funds to pay operating expenses. Connecticut issued about $560 million in bonding in 2013 to improve its cash flow. And Nappier’s office said it hasn’t had to temporarily transfer funds away from capital programs in more than two years.